Fits Outside Tile Dimensions: 6" to 8-1/2"
HomeSaver has designed all of its products with the highest degree of excellence down to the very last detail. 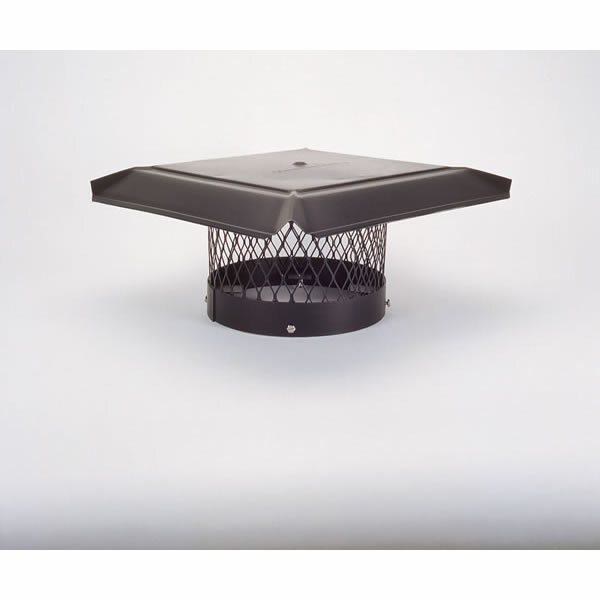 HomeSaver's constructed their chimney cap with black galvanized steel material and a durable 3/4" mesh. Weld nuts in the base of the cap ensure that it is solidly mounted without the fear of stripping the threads. Keeping your ease and convenience in mind, HomeSaver designed this to fit outside the designated tile dimensions (6" to 8-1/2"). Why can't I use this HomeSaver Pro 8 inch diameter base black steel chimney cap on my metal chimney pipe? This cap secures to the outside of a clay flue tile. Because prefabricated class A chimneys rely on a specialty cap that separates the flue gases traveling up the inner wall from the cooling air traveling down the outer wall, this style of cap cannot be used. Instead, a product like the HomeSaver Pro 8 Inch Round Chimney Cap for Air-Insulated Factory-Built Chimneys should be utilized. I dont have anything to say other than it fit our chimney perfectly and is doing the job for us. I recommend it! I was very pleased at how easy this was to put on the chimneyI was done in less than half an hour, and it fits like a glove. Great product for a great price. When I got this in the mail and tried to lift it out of the package, I said, Wow! I wasnt prepared for how heavy it was because of how well built it is. What an improvement over the old rusty one it was replacing. I put it on really easily and quickly, and in spite of some rough weather since, it hasnt moved. Im really glad I got it, and when its time to replace the cap on the other chimney on my house, Ill order another one just like this one. Because of some construction idiosyncrasies in our older home, we had an ongoing problem with creosote building up on our old-fashioned chimney cap. What a painwe had to clean it over and over again, and we were concerned that it might catch fire sometime. We messed with it for years, so when we got this cap and my husband put it on in 15 or 20 minutes and we could tell it was going to solve our creosote issues, we did some rejoicing. Thanks for making this great product! I couldnt find the kind of chimney caps I needed in any of our hometown stores, so I was happy to find this model on the website. I ordered two of different sizes because we have two chimneys on our home. Theyre economically priced and well constructed.